Deployed in pairs, the new scanning cloud radars share a common pedestal and can scan 180 degrees in every direction. To see the radars in motion, view this video. SAN FRANCISCO—In the past year, the Department of Energy’s Atmospheric Radiation Measurement (ARM) Climate Research Facility deployed 18 new scanning radars at its research sites in Oklahoma, Alaska, and the tropical western Pacific. These highly sophisticated new radars are providing extraordinary 4-dimensional information to help scientists better understand the life cycle of clouds. Today at the American Geophysical Union meeting in San Francisco, Gerald “Jay” Mace, a professor of atmospheric science at the University of Utah, discusses the research implications of these radars during a press conference on new weather and climate technology. Throughout the week, numerous other researchers presented preliminary results using data collected from the new radars. These new radars provide the world’s most detailed data about the formation, structure, and evolution of clouds and precipitation. These details are very important for accurately simulating cloud processes in climate models, particularly for under-represented regions like the Arctic and the tropical Pacific. Like the Doppler weather radars that TV meteorologists use for daily weather forecasts, the precipitation radars can measure the size and shape of water droplets and ice crystals falling from clouds, as well as the speed at which the cloud system is moving. The new cloud radars, on the other hand, emit pulses at much higher frequencies, improving their sensitivity to microscopic cloud particles. And unlike other cloud radar systems, they also operate continuously and unattended to provide data over time—the fourth dimension. Combined, the data from both types of radars give incredibly detailed information about the interactions between clouds, aerosols and precipitation in the atmosphere that make up the life cycles of clouds. This complex and dynamic process is one reason that climate models have such a difficult time simulating Earth’s climate, both at regional and global scales. Despite improvements in computing power, current weather and climate models are unable to accurately reproduce the formation, growth and decay of clouds and precipitation associated with cloud systems. Not only is this due to a lack of data about precipitation, but also about the 3-dimensional environment of the surrounding clouds, winds, and moisture, and how that affects the transfer of energy between the sun and Earth. To obtain this type of holistic data, the new scanning radars operate at multiple frequencies: the precipitation radars at 5 and 10 gigahertz, and the cloud radars at 10, 35, and 94 gigahertz. At these very high frequencies, the radars can detect particles ranging from 10 centimeters down to 10 micrometers. Various combinations of these radars are now deployed at the ARM Facility’s four permanent sites within three of the Earth’s major climate regimes: Arctic high latitude at Barrow, Alaska; continental mid latitude at Lamont, Oklahoma; tropical latitude at Darwin, Australia, and Manus Island, Papua New Guinea. They have also been added to each of ARM’s two mobile facilities; these portable observatories are deployed around the world for field campaigns lasting six months to a year, on average, to obtain additional data from under-explored climate regions. The new radars, purchased with a $30 million investment from the American Recovery and Reinvestment Act of 2009, were designed and built by ProSensing, Inc., of Amherst, Mass., Advanced Radar Corporation of Boulder, Colo., and Radtec Engineering Inc., from Broomfield, Colo. They complement the ARM Facility’s new 35-gigahertz vertical-pointing profiling cloud radars and nearly two dozen other instruments systems at each site that obtain continuous data to support studies of Earth systems. 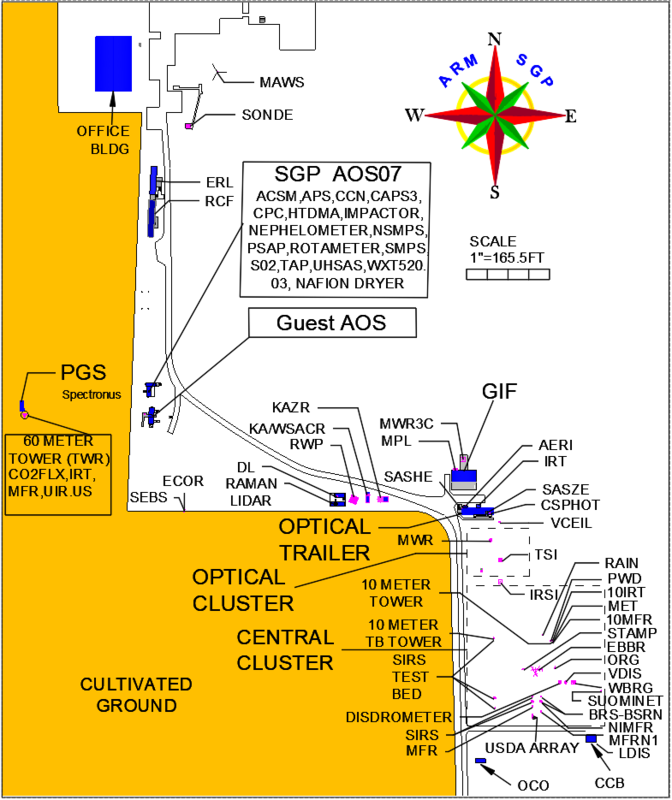 The ARM Climate Research Facility is a U.S. DOE Office of Science user facility with heavily instrumented fixed research sites in Oklahoma, Alaska, and the tropical Western Pacific. It also operates mobile and aerial measurement platforms to support research around the world. Researchers can propose to conduct their own field studies using these capabilities and all ARM data are freely available.